Nuts to be shelled are placed in a hopper at the top of this machine. The nuts pass into a beater chamber by means of a ribbed feed roller; the rate is adjustable. Rotating, flexible beaters break the shells, and a blower median ism separates the shells so that only the kernels are in the delivery chute. Wilkinson's No. 2 machine has a J i/2 h.p. motor and an output of 254 to 406 kilograms per hour. motor ami will produce up to 100 bags a day. Type C is powered by a 7 h.p. 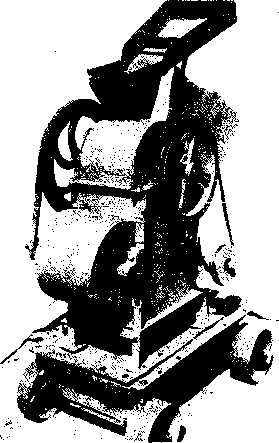 motor and will shell up to 120 bags per day, and Type D uses a 10 h.p. motor for a maximum output of 200 bags per day. 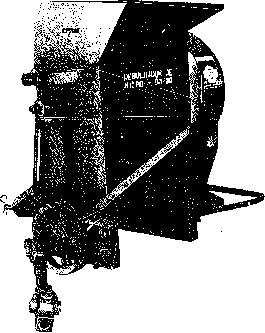 The hopper is on the upper part of the machine. Nuts pass from there into an opener cylinder where the shells are broken and separated from the kernels. The shelled nuts fall on the ground to be collected.